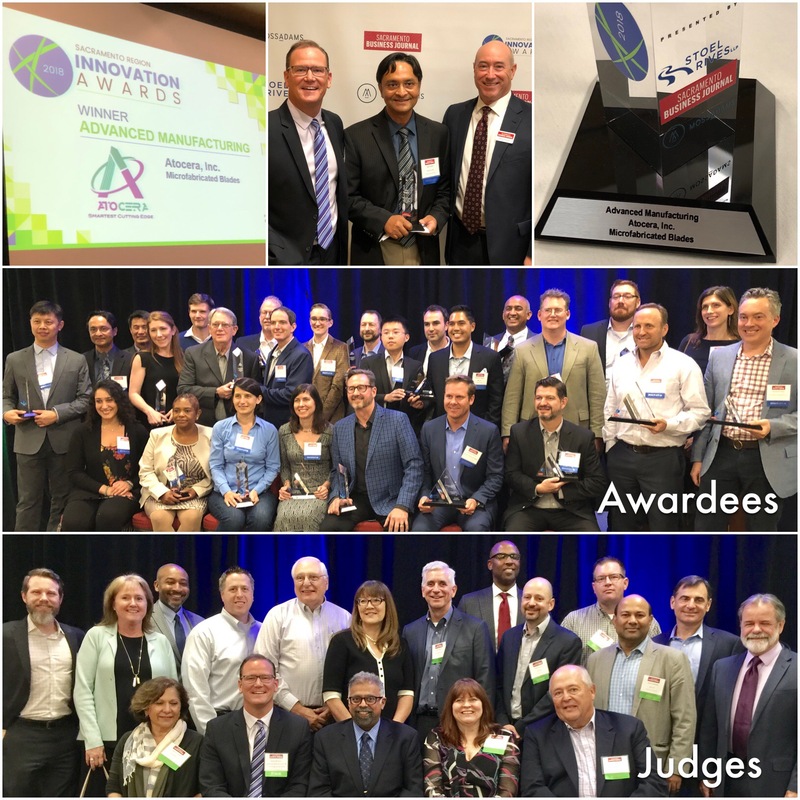 The Sacramento Region Innovation Awards program announced its winners last Thursday during a ceremony hosted by organizers Stoel Rives LLP, CMTA member Moss Adams LLP and the Sacramento Business Journal. Eight winners and 13 finalists were recognized during the luncheon, featuring master of ceremonies Kitty O’Neal of NewsRadio KFBK. CMTA was proud to be on the Advanced Manufacturing Selection Committee and congratulates Atocera, maker of low-cost ultra-sharp, rustproof ceramic and semiconductor blades with multi-dimensional self-cleaning cutting-edges, and integrated sensors for surgical and hair removal applications. In the future these revolutionary blades made from semiconductor material will be used in commercial everyday shaving products and in surgical procedures such as cataract surgery. Atocera's story is interesting. Technically, the company is the result of a shaving accident. Back in 2012, Saif Islam, a UC Davis professor of electrical and computer engineering, was building silicon micro-walls for solar panels. During the process of cutting semiconductor material into small slices, something unexpected happened. "While we were slicing, we came up with some slices that were very sharp,” Islam says. "So sharp that they could cause bleeding when handling if you’re not careful." He realized these ultra-sharp slices of semiconductor material, called wafers, could be used in other areas. With the same machine used to make computer chips, he could make thousands of silicon-based blades at once to be used for shaving and cataract surgery. This breakthrough led to the launch of Atocera in 2014. The blade itself is only two atoms wide and sharper than steel. The machine enables Islam to produce 5,000 blades at a time, which makes them much cheaper than blades currently in use by eye doctors. The awards program recognizes regional innovation across eight categories, honoring the people and organizations that advance new products, services and processes from the Sacramento area, which is defined as Butte, El Dorado, Nevada, Placer, Sacramento, Solano, Sutter, Yolo and Yuba counties. Nearly 100 nominations were evaluated by a selection committee consisting of local leaders from civic, business, academic and technology sectors. In addition to announcing the winners, there were 13 other finalists, of which past CMTA Champion TriTool was one for its TRIMAX Portable Pipe Machining Tool. The Sacramento Region Innovation Awards program was founded by Stoel Rives LLP and is facilitated by the firm’s attorneys and professional staff. Moss Adams LLP validates the voting process and the Sacramento Business Journal events division provides promotional and management services. Learn more at www.sacramentoinnovationawards.com and on Twitter and Facebook at #SacInnov8Awards.